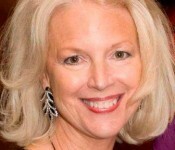 Judith Rothrock, founder and president of JRocket Marketing originated an event she holds annually for technology vendors and the analyst community. Called “The Grape Escape”, the event is typically sold out months in advance. We are asking Judith to explain what makes vendors and analysts enthusiastically put this gathering on their calendars year after year. The Bootstrap: Judith, you’ve cultivated a B2B industry event for more than ten years, for which you are 100% responsible. I use the term cultivated, because you have grown its’ breadth, reach and popularity over time. Define “Grape Escape”….who are the constituents and why do they attend? Judith: The JRocket Marketing Grape Escape ® is a trademarked industry news and networking platform owned by JRocket Marketing. The purpose is to provide enterprise technology vendors a unique way to showcase major, often breaking, news about their companies to the industry’s leading analyst influencers. 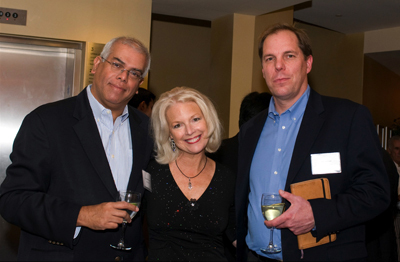 Judith Rothrock, President of JRocket Marketing, with former Gartner analyst and book author Vinnie Mirchandani (left) and Altimeter's Alan Webber at the 2010 JRocket Marketing Grape Escape® in Boston. It has a very defined and limited audience. Each tech vendor’s news is presented by a ‘C-Level’ (typically CEO) presenter and one ‘C-Level’ customer. The vendor can bring only 3 people: the CEO, the customer and one marketing officer, but no sales or others. On the analyst side, the event has grown from approximately 12 to 36 senior level analysts. We cut it off at 36 analysts to facilitate the relationship building that is a hallmark of the event. Grape Escape consists of three parts: a networking hour, a news presentation hour, and a formal dinner with entertainment. Today Grape Escape showcases three to four tech vendors, all of whom are clients of JRocket Marketing. The Bootstrap: Talk a little about the logistics. Why Boston in June? What is the dress code, as this goes a long way to setting the tone of the event? Judith: The location is optimal for industry technology analysts who come from as far as Canada, California and Europe. Boston is a nice mid-point, and also has several local analyst firms based there. The dress code is formal business attire or better. Many of the women wear evening attire, such as full-length dresses. The Bootstrap: What about the time commitment – isn’t this event only four hours? What is it about Grape Escape that makes folks fly so far from around the US and Europe for such a short time? Judith: Until two years ago, you were right, many analysts were flying 3,000 miles to attend just the four-hour event! They did so for two reasons. First, the event has a reputation for delivering important news. Vendors cannot present at the event unless they can meet specific requirements for announcing key news. Many hold off important product launches, partnerships or even mergers to deliver the news at this event. The second reason they came so far for such a short time is also based on reputation. Grape Escape is very special. It has a beautiful, memorable ambiance; five-star cuisine and entertainment by gifted musicians, such as harpists, classical guitarists, Broadway or concert pianists. In 2008 we served the exact cuisine and wines from President Obama’s inaugural dinner. The venue was the Old State House, now a Museum, in Boston where John Adams read the original Constitution to Bostonians for the first time. In fact, we had a John Adams impersonator/historian in period costume answering questions about the State House building, John Adams’ life, etc. I’ve been told repeatedly that there is nothing like Grape Escape hosted by even the largest vendors. Two years ago, at the request of analysts flying the longest distances, or analysts who were based in Boston but don’t get the chance to see California-based tech companies all that often in person, Grape Escape began offering one-on-one meetings with the tech vendor executives. These occur on the day before, the day of, and the day after Grape Escape. The Bootstrap: Based on the name, it sounds like you’ve chosen “wine” as the main theme and, frankly, Grape Escape blatantly does not sound like a B2B event. Yet from what you’ve described, it most certainly is a business event, versus a wine event. How did the name come about? Judith: There is a very interesting story behind the name! One hot summer, prior to my founding JRocket Marketing, while I was still a Vice President at Lawson Software, one of the analysts said to me, “It’s so stinking hot out there! If you really want me to listen to your executives you had better open your best wine bottle”. It got me thinking about how the most important occasions in life typically are accompanied by some sort of memorable food and wine celebration. Grape Escape wine is absolutely wonderful. We serve the types of wines most of us cannot (or choose not) to afford on a regular basis. People always remember the food and the wines from Grape Escape! The Bootstrap: Do you recommend that marketers get more creative in what they call their events? Judith: It’s not just the name that makes the event; it’s the theme, the presentation, setting crisp objectives and managing details to a painstaking level. That is why I do not off-load any portion of the event management. Each part is perfectly executed. The Bootstrap: Based on your experience, how would you rate the importance of the following on a scale of 1 to 10? With a 10 being “mission critical” to the success of an event. City: 10 – But choosing the specific city should be a function of both geographic convenience for the target audience and what the city has to offer in the context to event logistics. For example, if Grape Escape was an event that targeted Asian attendees, the location would be different. In today’s world, the enterprise technology analyst community’s borders tend to be from California to Canada to Europe. Venue: 10 – If it’s not a premium location, it will be forgotten as soon as attendees leave. Topic/Reason for the event: 10 – If there isn’t a major business reason or topic for the event, it won’t draw the desired attendees. Length of time commitment: 10 – Tied to quality and the usefulness of the time commitment, and not just quantity of time. Meaning there needs to be an understanding that all businesses are squeezing their resources to do more with fewer people…so attendees need to feel they are getting optimum value for their time commitment to any event. With Grape Escape, analysts can get important news briefings from three technology companies, along with customer commentary and meetings with key executives. It is an optimized way for them to accomplish several objectives in one event. “Fun factor”, especially for evening activities: I’d range this 5-10. If it’s a one-time event and you are announcing, say, a mega merger between two companies that’s of importance to your B2B attendee list, then they are going to come regardless of the fun factor. But, if you are trying to establish a reputation for an ongoing event held at regular intervals, you need to build the brand and you need to tie that brand to expectations. With Grape Escape, the “Fun Factor” is a very important part of what the attendees expect … and it brings them back year after year. Speakers: 7-10 Some events are built around specific speakers as the main draw; for other events, the news factor greatly outweighs the quality of the speaker. Depending upon the speaker’s role, this warrants a 7-10 rating. Meeting organizer (level of personal connection with the attendees): 10 – The meeting organizer’s role is always critically important to the success of the event – so from that perspective, it’s a 10. But the amount of the meeting organizer’s personal connection to the speaker depends on 3 factors: the size of the event (i.e. number of attendees), the complexity of components in the event, and executive level of attendee at the event. Smaller, more intimate, but highly-complex and high-level attendee events require personal concierge type service and immaculate attention to detail. For that reason, I do not delegate any details of Grape Escape to anyone else. From invitations, through meeting set up, through hotel confirmations, through the exact food that is left in their hotel room as a treat upon arrival, plus every detail surrounding the actual Grape Escape evening are personally managed by me. It’s a level 10 responsibility. Amount of “open networking” time”: 10 – Again, depends on the venue, but this is a full third of Grape Escape, and therefore ranks a 10. Any other factors to consider? Three things; gifts, follow-up actions requested by both the vendors and attendees, and keeping a list of things that worked well or didn’t work (along with ideas on how to improve). Oh yes, and advance planning. If you want to do a five-star annual event, you start work immediately after completing the last one. Quality events take 9-12 months of advance planning on the details. The Bootstrap: Let’s take a little deeper dive into the purpose of The Grape Escape. 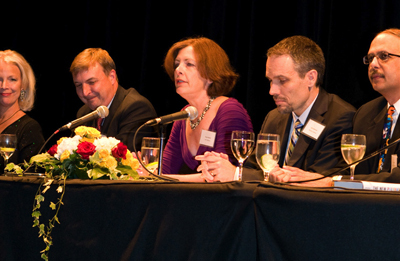 What can you tell us about the state of analyst relations in 2011? Can you share a few recommendations for how tech companies should be managing the process? Judith: The newest collaborative/communications technologies have become both a boon and a burden. A boon, because you now have instant access to anything and everything you need to successfully position and market a company, as well as instant knowledge of any changing factors. We can blast out a thought, an advantage, or a rebuttal in a nano-second and we can do it to either the universe or to an expressly-selected group of people. It’s a wonderful tool. But, conversely it’s information overload. We now have about 100 analysts tweeting and blogging on any given day; it’s impossible for anyone to track everything written…even when it’s in your specific solution space. There aren’t sufficient filters and there aren’t enough hours in the day to track what’s being said by those people whose views you value. You might want to, but it’s not physically realistic. Great analyst relations (AR) is not about tweeting your company’s message every day, it’s not reading or reacting to every single blog …even from important analysts….every single day. It’s not even counting the number of reports, blogs or tweets that mention your company’s name. Great analyst relations is about establishing, promoting and protecting a relationship that delivers specific outcomes that achieve specific corporate objectives. 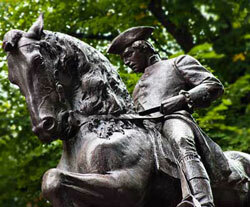 The right AR tactics very much depend upon where a company is in its evolution. With newer companies it’s all about getting on the radar screen in the right market segment with the right buyers; and the newest communications methodologies can support that beautifully. With established companies, the higher priority is establishing clear value, competitive advantage and competitive differentiation …not just throwing a bazillion parts of information to the widest possible audience. Both groups want the buyer to vote with their wallets; but each has to go about the task a little differently. For both type of companies it’s about selective, individualized efforts founded on trust. I once had a very well-known Gartner Group analyst comment on my AR skills/programs. They said, “You take your clients information, cut it up into attractively presented, digestible and tasty bite-size pieces, and spoon feed it to us so that we never choke on it. We all keep coming back for more.” I thought that was one of the greatest metaphors comparing and contrasting the more typical information overload that analysts get from other companies. It was a wonderful compliment. The Bootstrap: I’ve seen the analyst community join the journalist community on Twitter and the like. Are technology firms taking advantage of social media as a way to communicate with analysts? Why or why not? Judith: Yes, tech firms are leveraging social media, but right now it’s like throwing spaghetti up against the wall and hoping something sticks. There doesn’t seem to be any rhyme or reason to it for most. The Bootstrap: When a tech firm decides to approach an analyst firm, what are some analyst expectations they should keep in mind? 1. Have your corporate act together, and even if you are looking for help from the analyst to help determine your ultimate positioning/differentiation, be very clear about what you can and cannot do with your product or solution. That means you bring the right level person to sit down with the right analyst; different analysts are going to want to go to different levels of details. Have your facts, figures, concise information on your company/solution/products ready and available – no guess work. 2. Believe in your model – or don’t do the meeting. Analysts are very good at determining in pretty short duration if a company is or isn’t going to make it competitively, and a good part of that determination is a complete and compelling presentation of the corporate facts – coupled by a healthy dose of confidence. If your spokesperson isn’t sure about your chances to win, you can bet the analyst won’t be either. If your current spokesperson can’t speak with authority and conviction find a new one. 3. Establish a sound relationship and build trust first. Build your business relationship second. Companies that treat analysts like hired help and feel they are “owed” a pay for play result are going to find out very quickly that that is not how the tech analyst world works. That said, there is no arguing with the clear facts that analyst firms that accrue millions of dollars from the largest vendors, are sometimes not as objective as they might be. It is much harder for a smaller vendor to gain traction in reports like the Magic Quadrant, for example, but it can be done with a very targeted and buttoned up AR program that showcases a vendor’s solution to its best advantage. The Bootstrap: Thank you Judith, for your time and this great insight. I will forward to you any questions I get from readers. You can follow Judith at www.twitter.com/jrocketmarket.